Join us as we introduce to you over 30 minutes of behind the scenes tips and tricks from Hollywood Makeup Artist, Patty Bunch. Create a youthful glow and eyes that pop in just minutes with GENIE Beauty Products! GENIE Instant Line Smoother makes erasing not only fine lines, bags and puffiness easy but also the dreaded number 11 or nose to mouth lines that seem to creep up on us. Apply a double layer and watch the magic work! 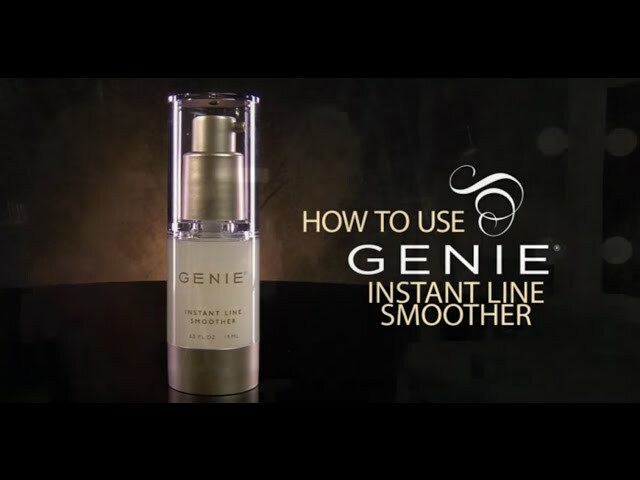 Instantly transform your face to FLAWLESS with the GENIE Instant Line Smoother. Smooth away fine lines, bags, wrinkles and puffiness with only 2 pumps and 2 minutes! GENIE Instant Line Smoother masks those pesky vertical lip lines and helps keep lipstick in place. Watch, at Hollywood Makeup Artists, Patty Bunch shows you how to master this trick! GENIE Instant Line Smoother can be applied on top of any lipstick and instantly seals in the color making transferring nearly impossible. Watch, as Hollywood Makeup Artist, Patty Bunch, shares her secret to long lasting lip color! GENIE Instant Line Smoother not only erases 10 years in 2 minutes but it also files in old acne scars and pores creating a smooth canvas for your makeup. Since GENIE Instant Line Smoother does not contain any harmful ingredients, it is safe to use on the most sensitive skin. Watch, as Hollywood Makeup Artist, Patty Bunch shows you how to disguise acne scarring with the one and only, GENIE Instant Line Smoother! When you have acne scarring you feel like that is the first thing people see when they talk to you. Fear not, with GENIE Instant Line Smoother & GENIE Nutratanicals Antioxidant Foundation you can easily disguise the lingering effects of old acne with this two step process. GENIE Instant Line Smoother and GENIE Line Smoothing Foundation work together to deliver beautiful, wrinkle free skin in just one step. Hollywood Makeup Artist, Patty Bunch, walks you through step by step on how to apply GENIE Line Smoothing Liquid Foundation like a professional! GENIE Nutratanicals Antioxidant Foundation is far from other mineral foundations on the market. -It is triple milled meaning it will not fall into you fine lines or wrinkles. -It is infused with Japanese Honey suckle which makes it super moisturizing, anti-inflammatory and gentle on your skin. -Foundation is true to color and does not leave behind any ashy effects. Watch, as Hollywood Makeup Artist, Patty Bunch, walks you through step by step on how to apply GENIE Cashmere Mineral Foundation like a professional! GENIE Make Me Blush makes contouring away problem areas easy. Tune in, as Patty Bunch, Hollywood Makeup Artist, shows you how to sharpen your jaw line with GENIE Make Me Blush! GENIE Make Me Blush delivers a beautiful, build-able, healthy glow. You can either apply before or after foundation for a warm wash of color. Watch, as Hollywood Makeup Artist, Patty Bunch shows you how to apply. GENIE Cashmere Powder is the secret to locking in your finished look. It will not cake, it does not fall into fine lines, wrinkles or pores and it is chock-full of super moisturizing skin loving ingredients. Hollywood Makeup Artist, Patty Bunch shows you tips to locking in your favorite look with natural finishing touches.